Lanterns' elegant and engaging game-play by designer Christopher Chung features a unique mechanic were players must balance the placement of their tiles or risk helping their opponents on their way to victory. It’s a give and take that provides hours of depth and strategy. Just looking at its components, you might guess Antoine Bauza designed Lanterns: The Harvest Festival. It’s vibrant colors, Asian theme, and artwork depicting a bamboo eating panda are reminiscent of Bauza’s Hanabi, Tokiado, and Takenoko. But Lanterns was designed by Christopher Chung, and it offers a fresh approach to tile laying games. Thoughtful design is evident in nearly all the components of Lanterns. The jumbo tiles, well written instruction booklet, and beautiful artwork on the cards demonstrate the designer’s and producers’ commitment to creating a quality product. Lanterns looks and feels like a high grade production. The game scales very well, as players remove discretely marked pieces for games with fewer than four persons. Gameplay is simple and straightforward. The object is to score points by collecting “dedication tokens”. Dedication tokens are earned by collecting various sets of cards. The cards come in seven colors, and players try and collect them in one of three combinations. They are four of a kind, three pairs, and one of each of the seven colors. The Dedication tokens are set up in stacks of diminishing point values (like the goods tokens in Jaipur), so getting sets early in the game is best. Players play “lake tiles” around a central “start tile”. The lake tiles have four sections (sides) of illustrated lanterns in seven colors that correspond to those on the cards. When tiles are placed, one of the sides faces each of the game’s players. Each player receives a card of the color of the side facing him on every turn. The person who plays the lake tile can earn additional cards by laying tiles so that one or more of the colored sides matches an adjacent side on an existing lake tile or tiles. There are special lake tiles called “platform tiles”, and they have a square image printed in the center of the tile. When a player plays a platform tile or lays a tile adjacent to a platform tile, he gets a wooden “favor token”. Once per turn, a player may trade two favor tokens plus one card for any card of his choice. The race to grab as many valuable dedication tokens can make for a strategic and competitive game. Placement of one’s tiles is particularly important late in the game, as only dedication tokens are totaled for scoring. Prudent, timely tile placement can help ensure a player isn’t left holding several cards at the end of the game. Lanterns: The Harvest Festival is a light, fun tile laying game that plays in about 20-30 minutes. The components are well made, and the sturdy box is not grossly oversized for its contents. I can relax and enjoy light conversation while playing Lanterns, and short games mean multiple plays per sitting. Priced in the $25 dollar range, Lanterns: The Harvest Festival is an excellent value and a fine game. Lanterns is one of the select few Kickstarter games we’ve received to truly deliver on the promises made by the publisher. The game provides players with a great puzzle that can be best described as Zen. Each round, players may trade favors, dedicate lanterns, and place a tile. That’s it, and for such a simple game it delivers a tremendous amount of depth and strategy. What makes Lanterns innovative is the tile placement. Each tile in the game has anywhere from 2-4 different colors, one color on each of the 4 sides. When a tile is placed every player gets a lantern of the color facing them. When placing a tile, you don’t have to match the color of the tile you place it next to, but if you do you get an additional lantern of that color as well. Some tiles have platforms on them and when you play or match one of these tiles you get a favor. Get 2 favors and you can exchange them and a lantern for a lantern of any other color. The whole point of gathering lanterns is to dedicate them. There are 3 dedications you can make: 4 lanterns of one color, 6 lanterns in 3 pairs of colors, and a set of 7 different colored lanterns. The value of these different sets is dependent on how many dedications of that type have already been made. The sooner you make your dedications the more points they will be worth. I find the experience of playing this game to be relaxing and pleasurable. This isn’t a raucous hyper-competitive game that will make friends into bitter rivals. This is a game that you sit around a table and play to enjoy the company of others while having a nice hot cup of tea. The games scales well, though I would argue that it plays best at 4. And, unlike many Kickstarters, it is a game that has been put through it’s paces and is as polished as it looks. I would recommend this game to families, casual gamers, lovers of tile-placement games, or anyone looking for something a little lighter for game nights with enough depth to keep the serious gamers at the table interested. This is such a great game. I like matching the colors, I guess it satisfies my OCD 😉 Also, there’s plenty of situations for playing strategically, either to increase your own points or just to destroy your opponents play. Kids and adults can play this together and still be at the same level, since kids can match colors easily and the game is random enough to not favor adults over children. The rulebook is easy to read and understand. The first game is quickly set up and running. The setup description makes it easy to adapt the game to 2, 3 or 4 players. The duration of a game is not very long, so you can easily play a couple of games without feeling exhausted. I would definitely recommend this game. We played Lanterns with four-players last night, and it’s a winner. Upon opening the box (the “new” smell was a little over-powering) and punching out components, we were impressed with the quality and artwork. A well-lit room will be helpful, particularly distinguishing the blue and green honor tiles (yellow might have been a better choice there). The rules are simple and straightforward; the only things we needed to hunt for were the use of the 4-point honor tiles and what happens when a particular card is “out of stock.” But we learned the game comfortably in just a few rounds. The level of strategic planning, placement, and resource management is just right for a casual-yet-challenging experience. There were laughs and mock-anger moments, and no one felt left behind or unduly threatened. This is an excellent game, in a very nice-sized box, that we’ll definitely be playing again. Highly recommended! 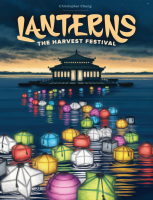 Add a Review for "Lanterns: The Harvest Festival"